LOUISVILLE, KY, and GOA, INDIA, OCTOBER 22, 2013 /3BL Media/ - Yum! 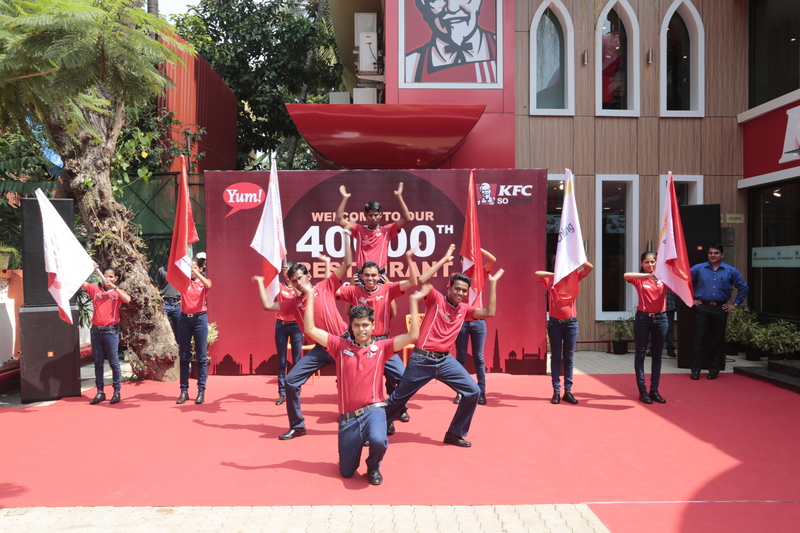 Brands (NYSE: YUM), the world’s leading restaurant company, announced the opening of its 40,000th restaurant, a flagship KFC store in Goa, India, to spotlight the Company’s emerging market leadership and growth. By 2015, India is expected to have $1 Billion in system sales, which includes company and franchise restaurants. By then, the restaurant company will have over 1,000 KFC, Pizza Hut and Taco Bell outlets in more than 100 cities. Yum! Brands is the worldwide leader in emerging markets with a two-to-one advantage over the nearest competition. The Company is also a leader in international development opening more than five new restaurants per day outside the U.S. with plans to open a record 1,450 new restaurants in emerging markets this year. Emerging markets represent tremendous growth potential for the Company. India is a key emerging market for Yum! Brands. It has a rapidly growing middle class and a huge, youthful population of more than 1.2 Billion people with 65-percent under the age of 35. It is predicted that India will have the largest consuming class in the world by 2030. India also has a great retail environment and is the sixth largest poultry consumer market in the world. The ‘eating-out’ market is estimated to be $94 Billion and only two percent is organized with national and international food retail brands. The new flagship KFC store is located in Goa, which is in India’s western coastal region. The store is based on a theme of ‘Soul, Spirit and Heart.’ It takes inspiration from the core brand essence wherein SOUL, stands for KFC’s commitment of great taste and quality reinstating its promise of Always Prepared Fresh, World Famous Secret Recipe, Great Tasting Non-Veg and 100% Vegetarian Products; SPIRIT is all about the pleasure of sharing with friends and family and having a great time-out; and lastly, HEART reiterates its belief of giving back to the community in which it operates. Spread across 4100 sq. feet, the store can serve over 130 people. KFC is the fastest growing quick-service restaurant brand in India, tripling in size over the last five years to 296 restaurants. Pizza Hut has been named the number one most trusted food service brand for seven years in a row. Through its brand proposition of ‘Pizzas and much more’ in India, it is currently present across 181 affordable casual dining restaurants and 132 Home Delivery locations. Taco Bell, Yum! Brands’ third international brand and the global leader in the Mexican-style food category, entered India in 2010 in Bangalore and has four restaurants located in the city currently. With ‘Growth with a Big Heart’ at the center of everything, Yum! India strongly believes in giving back to the communities in which it works and lives, making a positive difference in the lives of all its customers, associates, franchisees and their families. Yum! India has embraced the global World Hunger Relief initiative and also created a program that employs specially-abled (hearing and speech impaired) employees. Launched in 2007, the Yum! Brands World Hunger Relief initiative spans more than 130 countries and territories across 40,000 KFC, Pizza Hut and Taco Bell restaurants engaging with 1.5 million associates to raise awareness, volunteerism and funds for the United Nations World Food Programme (WFP) and other hunger relief agencies. Over the years, World Hunger Relief has raised over $150 million helping to provide more than 600 million meals to hungry women and children across the world. Additionally, as part of its employment program, Yum! Restaurants India has 20 specially-abled KFC stores where hearing and speech impaired people account for about 67 percent of the total staff. The program began in 2008 and has been running successfully for over five years. By 2015, Yum! India plans to have 1,000 specially-abled employees running 50 such stores. Yum! Brands, Inc., based in Louisville, Kentucky, is the world’s leading restaurant company, with 40,000 restaurants in 130 countries and territories. The Company's restaurant brands - KFC, Pizza Hut and Taco Bell - are the global leaders of the chicken, pizza and Mexican-style food categories. Outside the United States, the Yum! Brands system opened over five new restaurants per day, making it a leader in international retail development. Yum! is ranked #201 on the Fortune 500 List with revenues of over $13 billion in 2012 and in 2013 was named among the top 100 Corporate Citizens by Corporate Responsibility Magazine.